A new design concept which offers a variety of different shapes to open curtains. Designed by Hannah Allijin by simply pulling strings at the side of the corded curtain track the curtains begin to move. The fabric is made up with triangles which folded together one by one. As the cord is pulled various geometric shapes form until they stopped at the corner. The idea behind the concept was to ‘eliminate the colossus which arise when curtains are opened. The challenge is to change a big surface into a small form in different ways’. This is a great way to bring curtains alive and interesting during they day. At night the cord is released and the weight will return the curtain back to its ‘closed’ state. An ideal way to bring as much or as little light into a room as needed; as well as offering a great way to keep prying eyes out of a room by lifting the corner edges just enough to only let the light in! The appearance reminds me somewhat of scrunched up paper! 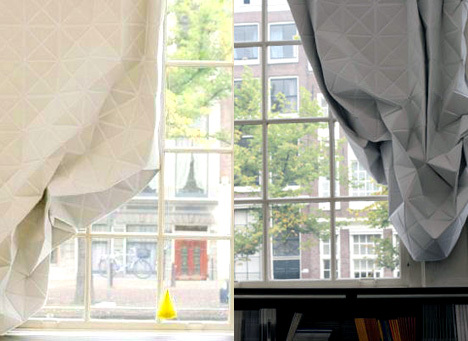 The Faceted curtains add fun and trendy way to dress a window. The plain neutral colours would blend with virtually all design colour schemes and interior styles; from traditional through to contemporary. An ideal window treatment for awkward shaped windows or those which are hard to reach, such as a landing.